Dissolving pulp, also known as specialty cellulose, is a chemically refined bleached pulp in which hemi-cellulose in addition to lignin are removed from the wood. Dissolving pulp has unique properties, including a high purity of cellulose and uniform molecular-weight distribution. Dissolving pulp is used in a wide variety of applications, such as the production of rayon textile fibres, acetates, cellophanes, tire filaments, filters and various chemical additives. It is also used by pharmaceutical companies and the food industry as a binding agent. Dissolving pulp is generally categorized into either rayon grades of dissolving pulp or specialty grades of dissolving pulp, based on its purity and other characteristics. Rayon, as the single largest application of dissolving pulp, is used in a variety of end products including textiles, wipes and hygiene products, home furnishings, medical and surgical products and packaging materials. In the textile industry, rayon is considered to be a substitute for cotton with positive characteristics such as dryability and arability. Specialty grades of dissolving pulp are distinguished from rayon grades of pulp based on their levels of cellulose purity, as well as their brightness and viscosity. The production process for dissolving pulp involves the chemical extraction of fibres from wood to obtain cellulose. To produce rayon grades of dissolving pulp requires the debarking and chipping of logs, the cooking and de-lignification of the resulting wood chips whereby the lignin and hemicellulose are separated from the cellulose, bleaching the cellulose with various bleaching agents, and finally drying the wet dissolving pulp and compressing it into sheets. To create specialty grades of dissolving pulp additional processing steps are required, which increase the purity level of the cellulose. Historically, demand for dissolving pulp had been concentrated in developed markets. Demand for pulp and dissolving pulp has historically been determined by the level of economic growth and has been closely tied to overall economic activity.  Demand for dissolving pulp is expected to continue to grow in Asian markets as capacity for VSF and other cellulose-based products grows, while at the same time demand develops in other markets. The growth in VSF production capacity in China has led to increased demand for dissolving pulp. We believe the long-term growth prospects for the world textile and fibre markets should continue to improve with increasing population and a growing middle class in certain markets. Demand for manmade fibre has increased while demand for cotton has continued to decline. VSF demand is anticipated to grow 5% to 6% per year as reported in The Fiber Year 2016. Xylitol is an, organic sweetener, a naturally occurring five-carbon sugar alcohol present in many fruits (strawberries, plums, raspberries) and vegetables. Xylitol is commercially manufactured for use as a low calorie, sugar substitute which has additional potential health benefits including dental and obesity, xylitol also has a very low glycemic index and does not spike blood sugar or insulin levels. Xylitol is the sugar substitute of choice for the sugarless gum industry due to superior mouth feel, menthol like cooling effect, better taste as compared to other sugar substitutes such as aspartame. It is almost as sweet as table sugar and contains approximately 40% less calories. In addition to his use in gum and other confectionary it is also used in jams, protein powders, bars and peanut butter. The personal care industry in toothpaste and mouthwash, cosmetics creams, soaps, shampoos, lip care, lotions acting as a humectant in certain formulations. The pharmaceutical products industry in vitamins, cough syrups and other supplements. Xylitol has potential in preventing cavities as it is not metabolized by mouth bacteria and may help in plaque buildup and remineralization of teeth through the production of saliva. There are also numerous studies investigating xylitol’s potential in providing benefits for ear infections, yeast infections. 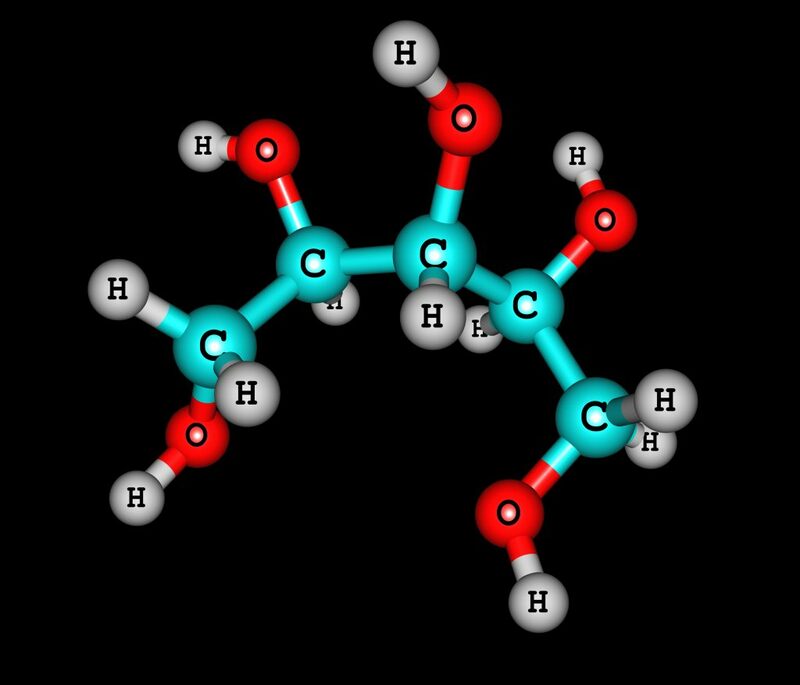 Xylitol is not readily digestible by most organisms, including human. This makes it an ideal low-calorie sweetener in stabilizing blood sugar levels.  Commercially xylitol is produced from xylan containing plant materials such as birch wood, corn cob, baggase, xylose is the main building block for the hemicellulose xylan.  The majority of xylitol production is in China utilizing corn cobs. Danisco is currently the only producer utilizing wood biomass feedstock in a sulfite pulp mill process. The majority of xylitol and bio-glycol technologies cannot deliver cost-competitive, sustainable products vs other sweeteners and petrochemicals because of low efficiency, outdated, polluting processes and high feedstock costs. In conventional xylitol production, yield loss is high, so producers focus on corn cobs, which are high in hemicellulose (~40-45%) or birch tree sulphite liquors. This improves net yield, but 90% of the biomass is still wasted. High losses prevent producers from considering other potentially lower-cost sources of xylose such as other hardwoods, wheat straw, bagasse, switch grass, etc. Most pulp is used to make paper, packaging and absorbency products and hemicellulose adds little in the way of strength, but it adds bulk, so mills try to maximize retention of hemicellulose to maximize yield. However, in some cases, such as dissolving grade pulps for rayon, acetate or viscose production, all hemicellulose must be removed from the cellulose fraction. The hemicellulose is washed out in the “liquor” following cooking. Hemicellulose used to be burned, but technology is emerging to keep the C5-rich sugars separate and available for other applications.